Well its 2013, and the rush for health club memberships is on (see Regulars Bemoan Influx Of New Members) as people embrace their new years resolutions to keep fit and be healthy. With annual membership attrition rates exceeding 40% for most fitness facility operators, however, the question I have is, "what do you do when the membership rush is over?". With any business, keeping a close eye on industry trends is a good idea to be competitive in the long term. 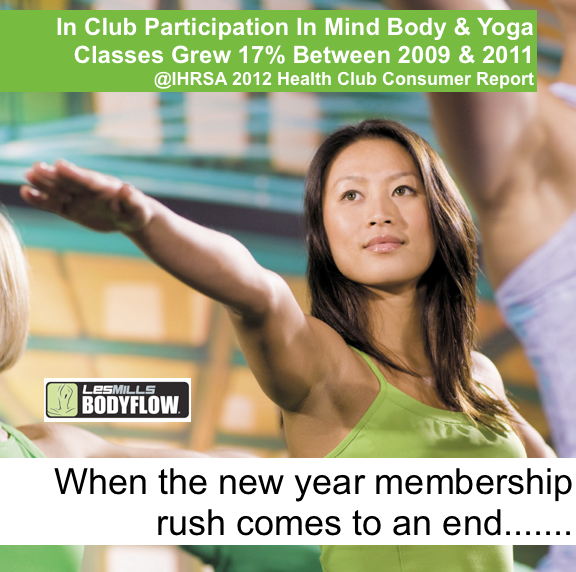 IHRSA's recent 2012 Health Club Consumer Report provides some interesting information on key trends. I suggest you get your hands on a copy. Most notable in the report are the fitness classes and group fitness trends . Did you know the most affluent health club members are those that participate in group fitness classes ? From 2009 - 2011, growth in fitness programs set to music soared over 15% and mind body and yoga classes grew 17%. There are a number of other interesting trends, including the growth of small group training formats. With the market increasingly going through a "consumer hour glass" or "bifurcation" trend, if you are not either a low cost or key club competitor, offering very compelling group programming that addresses overall trends is very important to your success as a health club or as any fitness facility. If you'd like to learn more about how you can enhance your group program offerings at your facility please let me know. We'd be happy to help. Keep an eye out for my upcoming report on Group Trends as well to learn more. 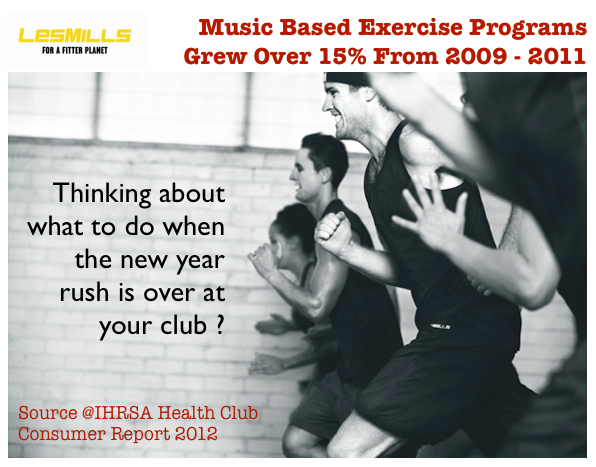 What do you think about these group fitness trends and the 2012 IHRSA Report ? Let me know your thoughts and happy new year !